See all of the Perfect Brewing Supply blog posts here! When brewing at home, I am very limited due to the small amount of open space in my apartment, and zero outdoor space to set up a propane burner. Therefore, my brewing set up is somewhat minimal. I use two pots, one to hold my strike water (which then acts as my boil kettle) and another for sparge water, and a 10 gallon cooler w/ false bottom as my mash tun. I have an 8 gallon pot and a 5 gallon pot, but because I am only able to get about 4.5 gallons up to a nice, rolling boil on my stove top, I do 3-3.5 gallon batches that I boil in the 5 gallon pot. I’ve been doing it this way for years and have my system very well dialed in and am quite happy with the beers I’m able to produce this way. 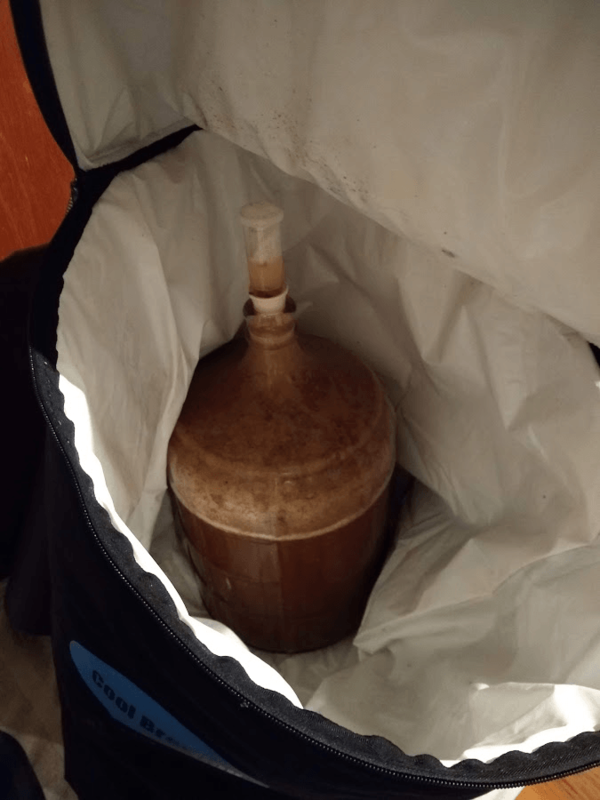 I prefer to brew low – medium gravity beers, but occasionally I will brew a high gravity beer. After pondering what to brew next, I realized that I’ve never brewed an English Barleywine. I decided to go for it and did some reading on the style and how it is brewed. I found that, traditionally, these beers were brewed not much differently than standard English pale ales, but with a much longer boil time (usually around 3-4 hours). Although it sounded like a long brew day, I decided to go for it. However, on my system, if I were to boil my wort for 3-4 hours, I would only be left with a gallon or so in my 5 gallon pot. 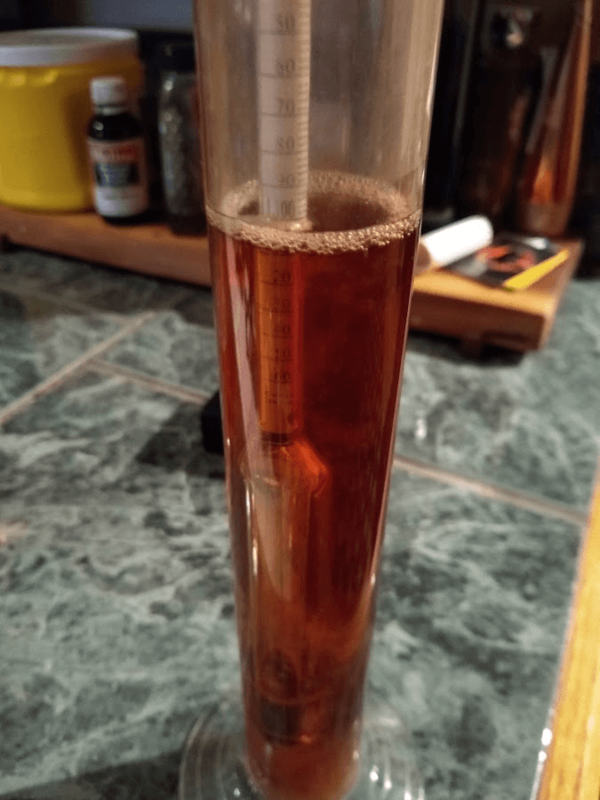 Such a long brew day with only 1 gallon to show for it? No thank you. I decided to get a little creative in order to get a better yield. Running off through a hop spider to catch all grain husk material that might make it past the false bottom. I started the brew day as normal by mashing in about 14 pounds of grain (remember, this is a 3 gallon batch) and hit my mash temp of 151F. I let the mash rest for about 90 minutes as I ran some errands. A slightly extended mash time helps to ensure as many sugars are converted as possible. I’ve noticed on my system that I lose some efficiency when brewing higher gravity beers (and I think this is typical of most systems). Typically around 5-8% efficiency loss, so I adjusted my Brewhouse efficiency from 68% to 60% when calculating my grain bill. I mashed a little bit on the thin side to ensure my first runnings would be about 4 gallons into the boil kettle. After recirculating and collecting my first runnings, I had about 4 gallons of thick, syrupy first runnings wort at around 1.084 SG. I started heating the first runnings as I continued sparging the grain bed into my other brew pot. By the time my first runnings had been boiling for about 30 minutes, I had another 3 gallons or so of second runnings wort (around 1.030 SG) that I began to bring to a boil on another burner on my stove. Pre-boil wort, light orange color at 1.084 SG. What I was doing was basically a “parti-gyle” brew, but instead of getting one big beer and one small beer, I decided to use the small beer to “top up” the boil on the big beer as it boiled and just go “all in” on the big beer. 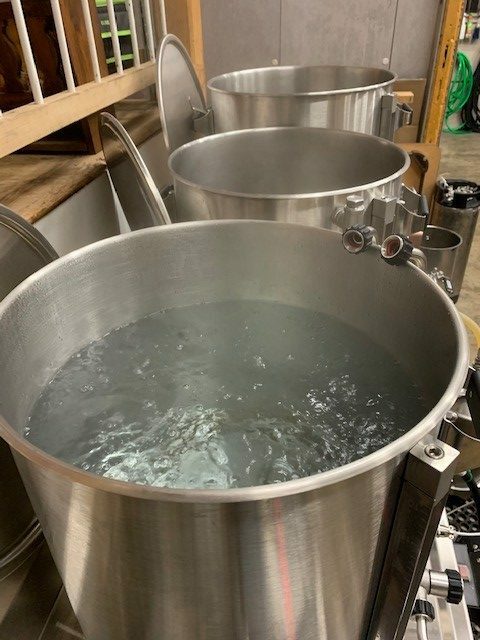 As the main beer boiled and concentrated, I continued to feed it more of the boiling second runnings to keep the volume up, but still continually concentrating the first runnings. After topping up and boiling off for about 4 hours, I decided to call it good. I still had a little second runnings left in the pot, so I could’ve continued to boil, but I figured 4 hours was long enough (plus, I was getting tired and still had to clean up). I transferred about 3.5 gallons into my fermenter, took an OG reading (1.102, an increase of almost 20 points from the pre-boil gravity), oxygenated the wort and pitched a big, healthy looking starter (OYL-006). I was pretty happy with this OG reading considering it comes out to almost 65% efficiency on my system, which is the highest I’ve gotten on a high gravity brew. Post-boil wort, deep red color at 1.102 SG. So much maillard reaction! The next morning, I oxygenated the wort one more time before leaving for work. A second dose of oxygen about 12 hours after pitching can be beneficial for very high gravity beers as the yeast typically needs more oxygen than it gets on the first dose. I came home that night to a very violent (or happy?) fermentation. Luckily, my fermenter was in my Cool Brewing Fermentation Cooler which not only keeps the fermentation temp a few degrees cooler than my apartment, but also contains quite a big mess. I cleaned it up, switched out the airlock and let it continue to rip (had to keep an eye on the airlock to make sure it didn’t clog for the first few days). After a week or so, the beer seemed to have fermented out completely. At time of writing this, it is still in primary right around the 4 week mark. I plan to move it to a secondary vessel very soon and allow it to age at least another 2-3 months before bottling (adding fresh yeast at bottling). Cool Brewing Fermentation Coolers are more than just temp control. Contained quite a mess! 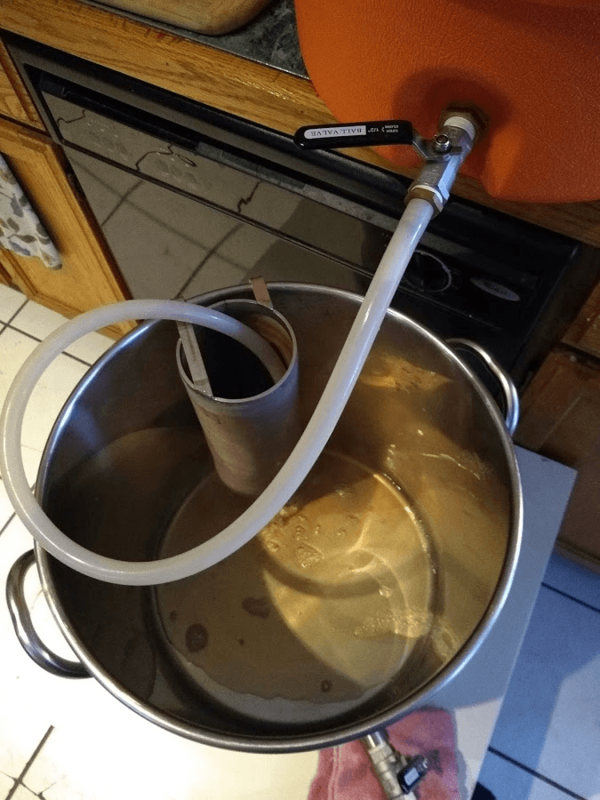 If you have a larger set up (a larger boil pot to hold an extra 4 gallons or so of wort pre-boil) and higher BTU output on your burner, then this method may not make sense for you. However, the extended boil is known to enhance the mouthfeel and viscosity of your wort (and of course increase the gravity), which many styles can benefit from, and this was the only way I could utilize an extended boil without sacrificing a large percentage of my yield. It seemed to work on my system pretty well, and I am happy with how it is going so far. Stay tuned for tasting notes some time in the next few months. The sound of a bone dry, effervescent, hop-forward beer is very appealing to me. As soon as I heard of this new style of IPA, I knew I had to try brewing it. 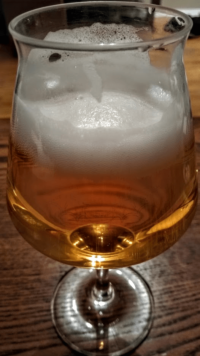 Apart from THIS ARTICLE (which wasn’t published until after my first attempt at the style), there is not a whole lot of info out there on how to brew a Brut IPA properly. More and more info is coming to light as more brewers try their hand at the style. 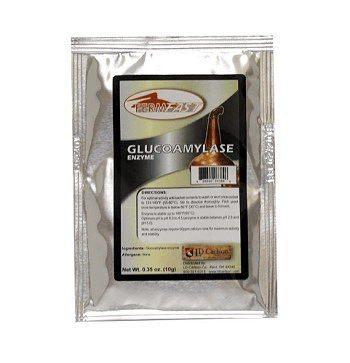 I used the dry version of Glucoamylase packaged by FermFast. It has worked well for me in the past when added directly to the fermenter. One of the biggest things that makes a Brut IPA so dry (terminal gravity around 1.000) is the addition of an enzyme called Glucoamylase (or Amyloglucosidase). This enzyme breaks down complex sugars created in the mash into more simple, easily fermented sugars. This enzyme is denatured at higher temperatures, so common practice is to add it either to the mash (around 143-146F) or directly to the fermentor right when you pitch your yeast (once the wort is chilled). For my first attempt at Brut IPA, I opted for the latter, mostly because it sounded easier. 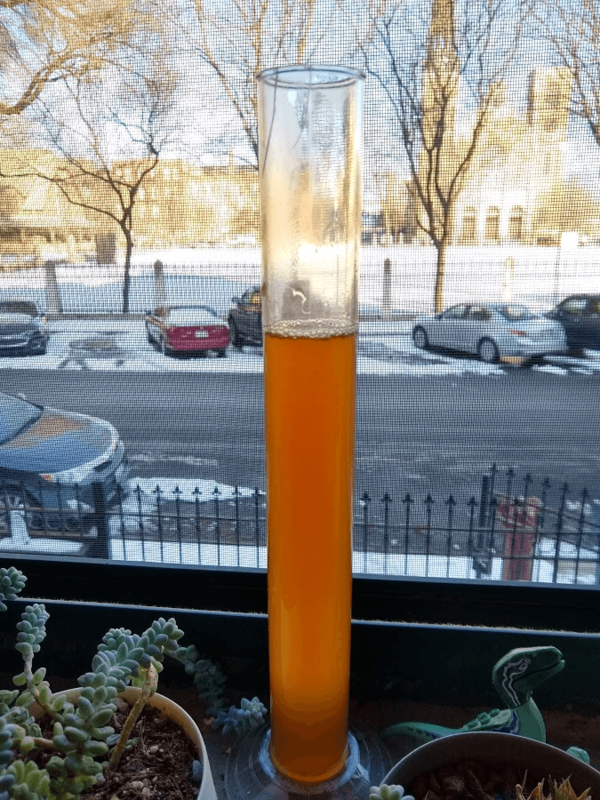 This method definitely worked quite effectively (that batch finished with a final gravity of .996… extremely dry), however, it felt like the hops were not shining as much as I would have liked. I dry hopped the beer quite heavily with about 8 ounces total in a 5 gallon batch, and they just seemed muted. Considering the massive dry hop, and the less-than-huge hop aroma of the beer, I was a little turned off by the style. A few weeks later, the article linked above was published. The creator of the style was interviewed for the article and gave his recommendations on how to go about brewing a Brut IPA. In the article, he recommends adding the enzyme to the mash. According to his experiences, the hop aromatics are much more pronounced when the enzyme is not present throughout fermentation. I had to try brewing a Brut IPA again. 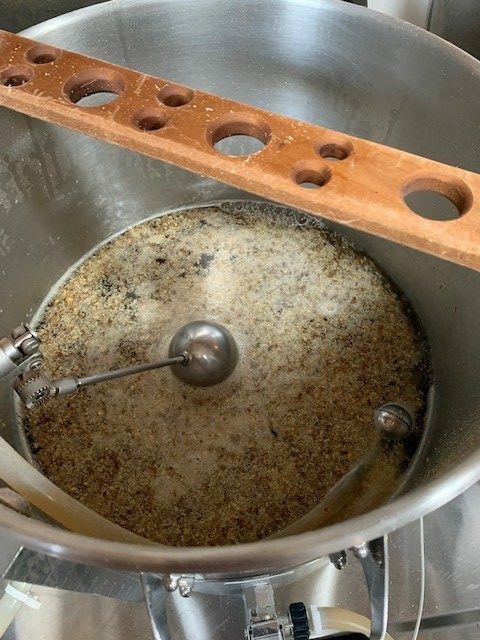 We set up to brew another attempt at Brut IPA, and once the grain was doughed in and sitting around 144F, we added the enzyme and stirred it in to mix evenly into the mash. It was a busy day that day, so my attention was not solely on brewing, unfortunately. We let the mash sit around 144F for about 30-40 minutes before ramping up to 150F to denature the enzyme and finish up conversion. This is where things went wrong, I believe. I do not think I let the enzyme have enough time to finish it’s job. The rest of brew day finished up rather smoothly and the beers were fermenting happily the next day. We went about dry hopping and eventually kegged the beer when it was ready. When kegging, I took a final gravity of each carboy (half of the batch fermented with OYL-004 West Coast Ale and the other half with OYL-091 Hornindal Kveik from Omega Yeast Labs). The West Coast Ale yeast finished at 1.008 and the Hornindal at 1.010. I was a little disappointed, however, the beers are tasting and smelling great so it is not a total loss. I don’t think I can justifiably call this batch a Brut IPA, so considering the higher final gravity, I will just call it an Extra Pale Ale. Recipe is below for those interested. The journey to brewing an awesome Brut IPA is still ongoing. For the next attempt, I will add a little more enzyme (looking back, I may have skimped on this a little) and let it rest in the mash for an entire hour, or maybe even longer just to be sure it does it’s thing. The article linked above is a great resource, but make sure you follow ALL of his directions, or you might just end up with a light-bodied IPA instead of a bone-dry Brut. Starting the beginning of January, I had an idea. I am not sure if it was a good one yet, but only time will tell. I was looking at the BJCP ( Beer Judge Certification Program) guidelines and thought it would be a good idea to brew one style from each category. The BJCP currently has up to 40 different categories listed including mead and cider. This will certainly be an adventure. Questions and comments are appreciated. “A highly-attenuated pale lager without strong flavors, typically well-balanced and highly carbonated. Served cold, it is refreshing and thirst-quenching.” It is also know to have a very low hop, malt, and yeast characteristics, hence why you drink it ice cold, there isn’t much to taste! 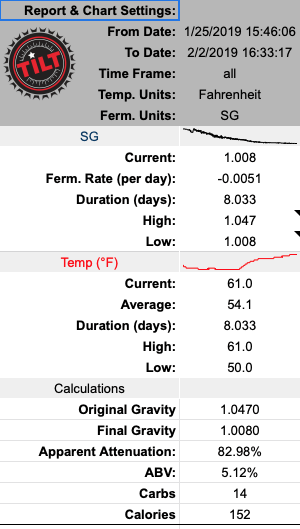 On brew day I did overshoot my gravity and volume a bit, I have been getting awesome efficiency on the Blichmann Horizontal Brew System and will be adjusting my recipes a bit to reflect the gained efficiency. Now beer is currently in the lager chamber and waiting on the taste test once carbonation is complete. I will update with more details shortly. I brought this beer to the Lake County Craft Beer Festival and it was certainly not the most popular option, but it was appreciated by many of our visitors. I enjoy the 3.5% ABV as a festival where many of the beers are much stronger. It does taste true to its description, not much there, but a bit of sweetness, which I attribute to the high percentage of corn. It is a yellow fizzy beer, that is pleasant to drink. I did enter this into two competitions, The Drunk Monk and the Charlie Orr competition. The International Amber Lager, is a bit more of a crowd pleasing style. This style taken from the guidelines is “A well-attenuated malty amber lager with an interesting caramel or toast quality and restrained bitterness. Usually fairly well-attenuated, often with an adjunct quality. Smooth, easily-drinkable lager character.” I can’t wait for this beer to be ready to sample! To monitor fermentation I used the Tilt Hydrometer and a Rasberry Pi, so I could see what the temperature and Specific Gravity was reading from anywhere I could connect to the internet. Very cool piece of equipment, it may be one of the coolest things I have seen in awhile. This technology gave me a better indication to when I should warm up the beer for a diacytl rest as well as giving live action data. This beer is slowly becoming a favorite style around the shop. It is fantastically refreshing and easy to drink. Its characteristics described from the BJCP are, “Rich, characterful, pale Czech lager, with considerable malt and hop character and a long, rounded finish. Complex yet well-balanced and refreshing. The malt flavors are complex for a Pilsner-type beer, and the bitterness is strong but clean without harshness, which gives a rounded impression that enhances drinkability”. Seems simple enough right… Pilsners are the most consumed beer in the world, some experts say somewhere around 90% of all beer consumed in the world is a pilsner type beer. So why aren’t more homebrewers brewing Pilsners? For one you need consistent temperature control, which is sometimes hard to find, or homebrewers aren’t interested in investing in temp control for their home. The recipe is not complex, but this is a style that highlights the brewers processes and attention to detail, which is something that I don’t pay as much attention to as I should. Yeast Omega Bayern Lager Yeast. I am still reusing the the yeast cake from the first beer of this project. Water is very important to making a nice Pilsner, I tried a method that I will was a bit easier for me, but only time will tell if the process of boiling my water the night to reduce the hardness of the water as well as remove chlorine and reduce O2, but without measure the level of O2 its really hard to know. You may be wondering why I used a Floor Malted Pilsner Malt and a Barke Pilsner Malt instead of just using all the same. The Floor Malted Pilsner Malt is less modified, so basically what it means is that you have to work a bit harder to get all the goodness out. It is a more traditional way of malting grain but it gives you earthy flavors and more intense aroma, according to Weyermann. The Barke Pilsner malt is malt that is better modified and gives many of the same characteristics of the Floor Malted, but with better brew house efficiency. To get as much as could out of the malts and to make for a longer brew day I also step mashed with rest at 113, 137, 149, and mashed out at 170 degrees. It is time to can your own homebrew! Guidance from our staff to help you along the way. Canning and cleanup with two people will take approximately an hour. Allow more time if you are by yourself. 16 oz cans will be available as well for no additional charge. We may not always have 16 oz cans in stock so call ahead to check availability. For additional charge you can have labels custom made and printed with your image or design. Or use one of our ready to go labels. 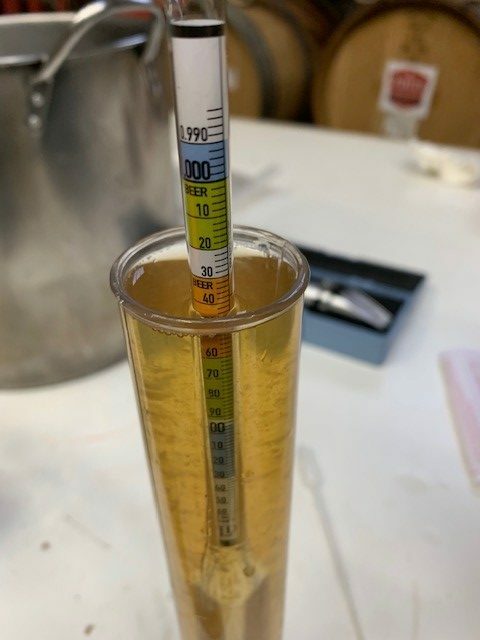 We are currently testing to see what happens if you “ Can Condition “ your beer adding priming sugar to uncarbonated beer. Call or email to schedule a time to can your homebrew!